Every 2 to 3 months Rita Lasker comes out with her latest Forex trading strategy. 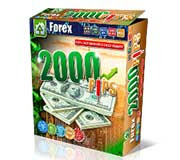 This time, the Forex 2000 Pips Robot seems to follow the usual routine. Despite there being great advances in trade reporting and data analysis in the past few years in the meta-trader market, Rita continues to rely on screenshots of short trade windows. If you are a Forex robot trader then you likely know that short sample sizes never really tell a true story of how a robot will perform long-term. Almost every single Forex EA can put together a single month of profitability but this doesn’t predicate future results.